1) Legally Required Amendments – 28 California Code of Regulations Section 1300.71(m) allows Qualified Health Plans (QHPs) to make material modifications to the underlying contracts so long as they provide 45 days advanced notice with the opportunity to terminate the underlying agreement if the physician does not agree. This is how QHPs are contracting with Physicians to be part of the Exchange, rather than by entering into new contracts. b) If a Physician does not agree to an amendment, the Physician should review the underlying contract with the QHPs to determine whether they have time to opt out of the amendment or the entire contract. If there is not time to opt out, Physicians should find out what other options they have. a) Reimbursement rates may vary depending on the type of health plan the patient is enrolled in. Physicians are advised to get all fee schedules. Understand your patient population and the issues that will come from a different population from the Exchange, to make sure that the pricing is sufficient to cover costs. Physicians are recommended to check each Health Plan’s website on the first day of each calendar quarter for updated pricing. b) Physicians are required to use their “best efforts” to accept electronic methods of payment and receive related explanation of benefits via electronic funds transfer. This means Physicians will need to take steps to make sure they can accept electronic methods of payment to prevent being in breach of the contract with the QHPs. 3) Physicians are Required to Collect Copayments, Deductibles and Coinsurance – Only Physicians are responsible for collecting copayments, deductibles, and co-insurance. This can create collections issues with grace periods under the ACA. a) Physicians should be aware that depending upon the type of plan selected, a patient can have significant cost-sharing for copays and deductibles with an Exchange. This may result in greater incidence of bad debt and increased administrative costs due to increased collection efforts. b) Physicians should require copays at the time of service. c) Physicians should implement a policy to check the insurance eligibility of each patient prior to seeing them. d) Physicians should implement a policy to require copayments and deductibles be paid prior to seeing a patient unless there is an emergency situation. e) Physicians should consider hiring a billing/collection company to assist with the above. 4) Termination of Contracts – The contracts with the QHPs have two ways of terminating, either mutually without cause, or unilaterally if it is for cause. Generally, either party may terminate the contract without cause by providing fair written notice (typically 120 days prior). Generally the term of the contracts is for one year with automatic renewal annually. If the termination is for cause, the QHP must give notice of deficiency to cure. There are provisions that allow for immediate termination, which Physicians should review and make sure they are aware of. Physicians can terminate the contract if a legally required amendment causes financial hardship. Physicians are advised to review termination clauses associated with exchange products carefully because for some contracts such as Blue Cross and Blue Shield, if they did not opt (in/out) prior to the deadline under the QHP, then they have to opt out of the entire PPO Plan. 5) Dispute Resolution Procedures – Contracts with the QHPs have specific dispute resolution procedures that require the Physician to first file a complaint with the QHP’s internal grievance department, meet and confer, and then use binding arbitration if not resolved by the prior methods. If the Physician does not follow this process, the QHPs can argue that the Physician failed to exhaust the administrative remedies and be barred from pursuing his/her claim. 6) Out of Network Referrals – Contracts with QHPs have very strict provisions regarding out of network referrals and it can be a breach of the contract with the QHP if it is not followed. Generally QHPs require Physicians to refer patients to participating providers unless written authorization has been granted in advance by the QHP, unless it is an emergency. 7) Nondiscrimination Clauses – Contracts with QHPs have nondiscrimination clauses so that Physicians cannot deny care to patients simply because they are enrolled in Covered California. 8) Compliance with state and federal laws – Physicians should be aware of their obligations to have an up to date Health Insurance Portability and Accountability Act (HIPAA) and Electronic Medical Records (EMR) compliant system or they will be in breach of the contract with the QHP. 9) Maintenance of Malpractice Insurance and Medical License – Physicians are obligated to maintain their medical license free from any restrictions or limitations and also to maintain medical malpractice insurance, or they will be in breach of the contract and could be terminated for cause without the ability to cure. 10) QHP’s Policies and Procedures – Physicians are generally required to comply with all QHP’s policies and procedures, so it is highly recommended that they obtain a copy of the QHP’s Provider Manuals and review them. Contact Matthew L. Kinley, Esq at Tredway, Lumsdaine & Doyle if you are subject to audit or need advice about your compliance program. According to the Centers for Medicare and Medicaid Services, about 10% of the healthcare providers who took advantage of the meaningful use incentives will be audited by a private contractor hired to look for errors. Under the 2009 HITECH Act, health care providers who demonstrate meaningful use of certified electronic health records will receive incentive payments through Medicaid and Medicare. States can receive a 90% federal funding match for incentive payments distributed to Medicaid providers who adopt EHRs under the meaningful use criteria. Eigible physicians who see Medicare and/or Medicaid patients, as defined by the HITECH Act summary, will be compensated from $44,000 to $63,750 over a 5 year term for fulfilling the recently defined ‘meaningful use’ criteria. To further promote the use of certified systems, if these same physicians do not utilize healthcare IT that meets the Federal requirement by 2015, they will be faced with increasing penalties of up to 5%. Providers started receiving Medicare or Medicaid bonuses for using certified EHR technology in 2011 and will get around $20 billion over five years. The meaningful use incentive program requires hospitals and eligible professionals (e.g., physicians) to use EHRs to improve patient safety, quality of care and patient-provider communication. 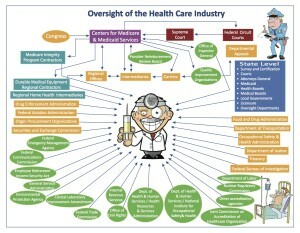 Providers must buy EHRs from vendors on the Certified Health IT Product List (see http://healthit.hhs.gov/chpl). If they don’t, they face a Medicare payment reduction after 2015. Documentation to support attestation data for meaningful use objectives and clinical quality measures should be retained for six years post-attestation. Documentation to support payment calculations (such as cost report data) should continue to follow the current documentation retention processes. States and their contractors will perform audits on Medicaid providers. When providers are selected for an audit, they will receive an initial request letter from the auditor. The request letter will be sent electronically from a CMS email address and will include the audit contractor’s contact information. If there is any deficiency in the audit, providers will have to give back their entire meaningful use incentive payment. That means their payments for the audit period are at risk unless their electronic health records show they kept every promise they made to the government when they accepted the money. One letter from the EHR HITECH Incentive Payment Center said a meaningful use audit had determined that “an overpayment of HITECH funds has been determined and is owed.” CMS gave the provider 30 days to repay the money, although it had the right to appeal. Most providers are having negative audit findings and owing the money back, often because they thought they met most of the core elements, but they didn’t get them all done, or they weren’t all properly documented. If you miss a core element, they ask for all the money back. The security risk analysis is a problem area in meaningful use. Providers must attest that they conducted a risk analysis, which is a core measure as well as required by the HIPAA security regulation. Most providers fail to do such an analysis. The following practices should be employed as soon as possible by all providers. Those who worked for and obtained benefits for meaningful use are particularly vulnerable. • Enter accurate numbers when you attest to meaningful use of an electronic health record (EHR). • Keep your supporting documentation. • Know that dated screen shots provide a good source of documentation. • Save paper or electronic copies of reports used to attest if the practice’s EHR automatically changes numerator and denominator values after the reporting period ends. • Turn on, for the entire reporting period, EHR features that track functionality issues, such as drug interaction checks and clinical decision support. • Understand that the security risk analysis must be specific to the EHR and the practice and is required every year.